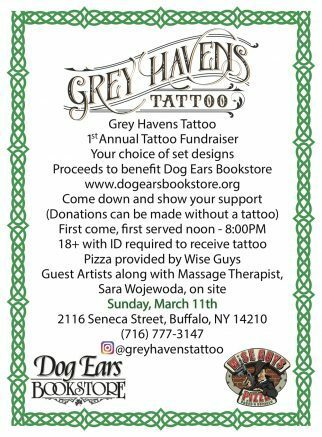 Dog Ears Bookstore & Café in South Buffalo would like to thank David Jednat, Melissa Blaszak and the tattoo artists at Grey Havens Tattoo on Seneca Street for hosting a successful tattoo fundraising event on March 11 to benefit the nonprofit community bookstore. More than 60 customers received new ink during the event! Special thanks are also extended to Jay Seefeldt and Wise Guys Pizza for donating several pizzas to the event, massage therapist Sara Wojewoda, and the gang at Hook and Ladder Development for their many contributions. Located at 688 Abbott Road, Dog Ears is a nonprofit neighborhood bookstore and literacy center. For more information, please visit http://dogearsbookstore.org or follow Dog Ears Bookstore on Facebook for frequent updates. Be the first to comment on "Unique tattoo fundraising event a huge success for Dog Ears Bookstore"